GM today began building and sending to dealerships pickup trucks that do not have to use any gasoline. Rather than using only gasoline, the new GM trucks are bi-fuel. They can run on gasoline or they can run on compressed natural gas (CNG). These trucks, if they become popular, will join only the Honda Civic as vehicles that one can buy directly from a major manufacturer in the US that can run on CNG. A driver of a CNG vehicle does his or her part to address these common concerns. Natural gas is plentiful in the US and we do not fight wars over it. Also, according to the generally held belief, CNG when used to power vehicles, is lower in the pollutants we measure (such as NOx, CO, and Hydrocarbons unburned at the exhaust) and also lower in carbon dioxide emissions than gasoline. Even better, the economic argument is hard to lose with CNG. Those who switch to it actually do see lower fuel costs. Nate Pumphrey, Chesapeake Energy Corp. director of Fleet Operations commented on a conversion done by the company saying “At Chesapeake, we are converting our fleet of more than 5,000 vehicles to run on natural gas, and having options from GMC and Chevy is critical to help us reach our conversion goal. Following our full conversion, we will save $11 million to $12 million annually on fuel costs.” Across the US buses, garbage trucks, 18-wheelers and many other heavy vehicles switch to CNG for this reason alone. What many people may be surprised to learn is that when the new GMC Sierra and Chevy Silverado trucks are running on CNG there is no performance degradation – they run just as strongly as they do when they are using gasoline. Ed Peper, General Motors U.S. vice president of Fleet and Commercial Sales, commented saying “Customers are choosing our bi-fuel trucks because they provide the same high level of GM truck performance and versatility but can also help businesses control their fuel costs and reduce their carbon footprint.” GM backs the trucks with its usual 100,000 mile limited powertrain and emissions warranty. One other added benefit of bi-fuel trucks from GMC and Chevy is range. 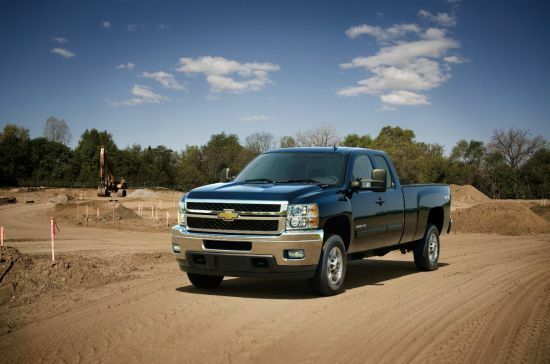 Combined, using up both tanks, the GM Sierra and Chevy Silverado’s have a range of 650 miles. This is notable because one thing that many supporters of diesel powered vehicles often enjoy is longer range. Since the bi-fuel trucks can now match that benefit they may win over some supporters for whom driving for 11 hours without a stop to pee is critically important (kidding). The trucks do need to be ordered, they are unlikely to be in stock for sale at this point, and they do have a price premium of about 20% compared to a single fuel truck. Many feel the cost is recouped over the life of the truck. The GMC Sierra HD and Chevrolet Silverado HD models, built by an American auto maker, which do not need to use a source of fuel from outside the boundaries of the US, are being built by Americans, here in Fort Wayne Indiana. Please note that the author’s opinions may not the same as those pointed out in the story to be held by many.